An exciting new trend in bike-commuting recently emerged in Bend. The bike lane at the intersection of US Highway 20/97 and Mt. Washington Drive has been colored with bright green strips. 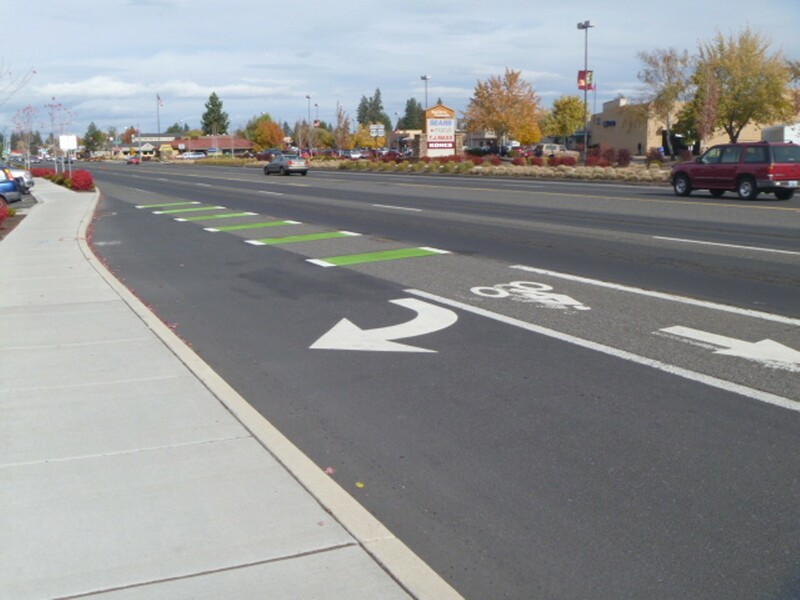 The colored strips, which were put in on Oct. 30, are meant to make drivers more aware of cyclists, according to officials at the Oregon Department of Transportation. "Bicycle commutes are on the increase, ODOT recognizes that, and we're looking to incorporate bike commuters with the rest of traffic," said Peter Murphy, ODOT's public information officer. So far, the green bike lane near the Riverhouse is the only one of it's kind in Bend. But, come spring, ODOT plans to add similar lanes to the bike lane at Greenwood Avenue and Eighth Street. But instead of colored strips, ODOT will transform the bike lanes into a solid green path, much like some of the lanes you may have seen in Portland. Apparently it's not just green paint on those strips, but a thermoplastic material with an anti-skid treatment, which is expensive. That's why ODOT is holding off on the second bike lane modification—they want to see how their first test piece holds up during winter operations. ODOT is hoping they can use a cheaper method on the bike lane at Eighth Street, and one that they can install themselves rather than hiring an outside firm as they did at Mt. Washington Drive. ODOT officials said that they picked Eighth Street and Mt. Washington Drive because both spots have been areas of "bikes and cars in conflict." Hopefully, the green lanes will make all road users more aware and thus safer. We hope to see more of these green lanes on other busy Bend bike lanes.